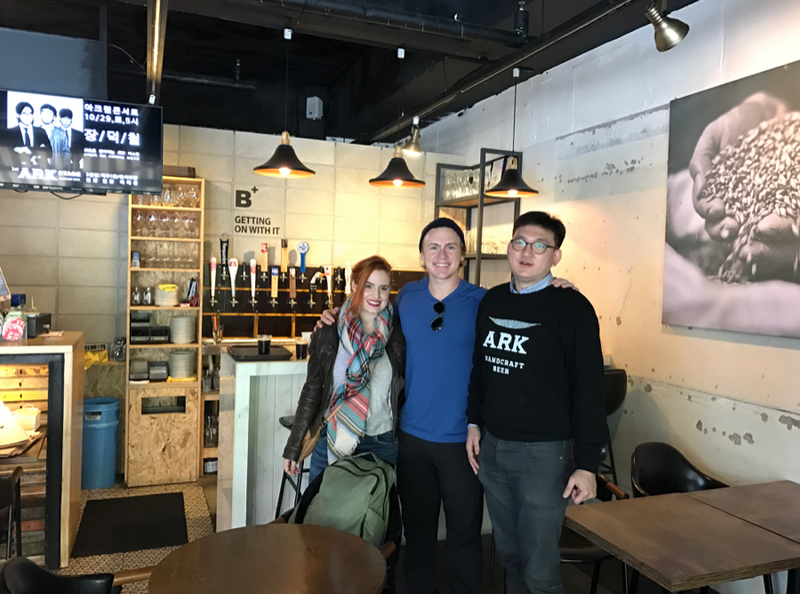 The Blonde Guy is drinking in...KOREA! Translation: Hello from The Blonde Guy! Its been a while since I've seen you all, and my what has happened since! I can't believe it has been almost two whole months since we landed in this beautiful country and started our journey with the Jekyll and Hyde world tour. From the moment we got on the plane at JFK it felt like we were in a different world. Stepford-esque flight attendants, friendly seat-neighbors (shoutout to JT! ), good food, and free beer all were an amuse-bouche for the smorgasborg to come. 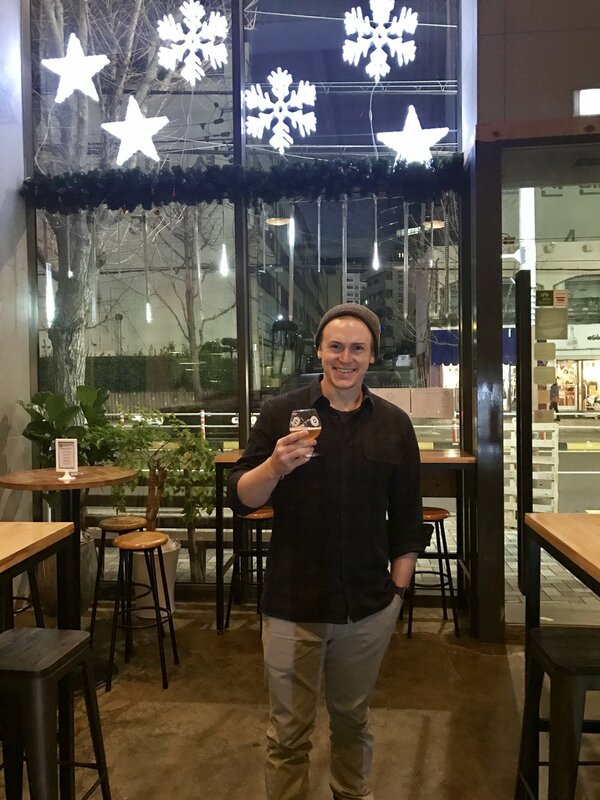 While the first brewery post is in the works, I wanted to give a basic overview of what I've observed in the beer scene/culture while in Seoul and Daegu. The first stop on our tour of Korea was rehearsal for a month in the capital city of Seoul. 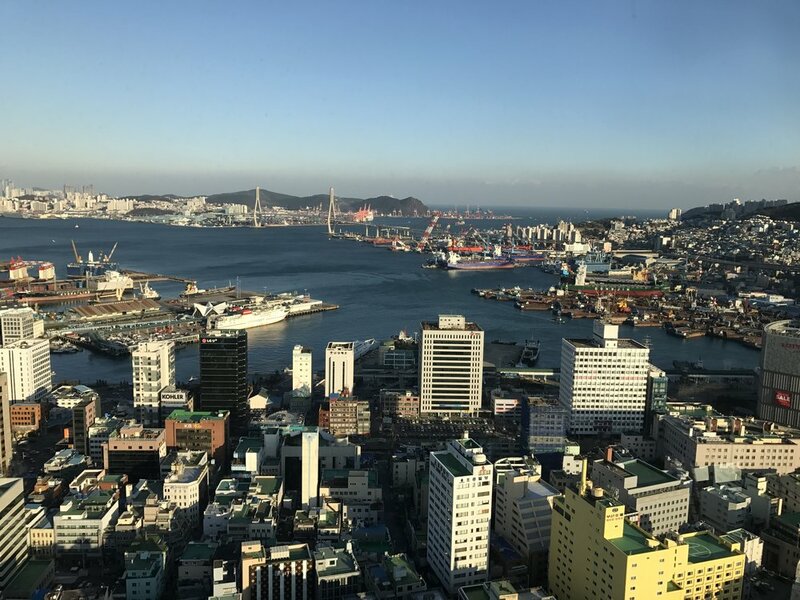 One of the world's most technologically advanced cities and home to more than 25 million people(half the population of the entire country) it is certainly the cultural hub for the nation's citizens. Everyone in the Gangnam-gu district, yes that Gangnam from the popular song, is clad in either business attire or fashion way forward. No matter what you're wearing, where you work, or what time of night it is, one thing brings everyone together when the sun sets: Beer. Most of the beer here in Korea is contract brewed by much larger beer companies, (think Macro brewers like Anhueser-Busch, SABC, etc...) These beers are the traditional drink-to-get-drunk light lagers and ales with a an ABV that never exceeds 4.5% and you can buy a liter at a convenience store for the equivalent of $1.75. Drinking is as deeply rooted and crucial to South Korean culture as kimchi is. It is tradition and a way of life. One that shows no signs of fading away, rather, with the help of the recent craft movement, is growing more and more vibrant. Now, the craft movement still being fairly young in the country, I had many friends who had visited or are from Korea state that I would have a difficult time finding real, Korean brewed, beer. 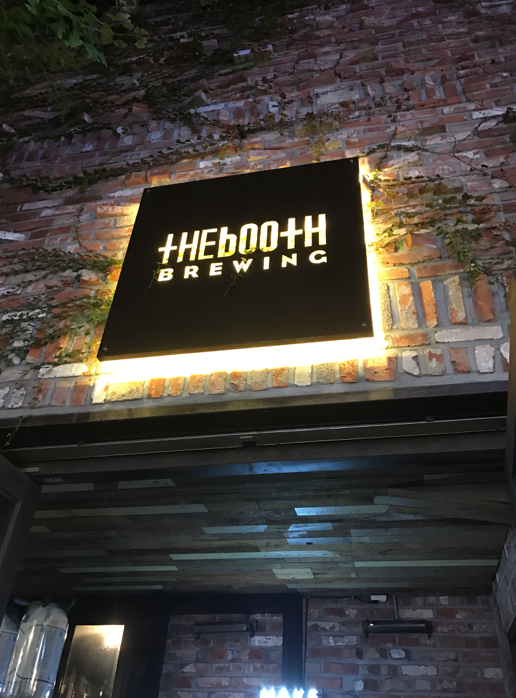 "The Booth Brewing Co." was the first craft bar that some comrades and I visited in the bustling hills of Gangnam-gu. From the first beer on the tap list to the last, my worries of having a non-palatable experience here dissolved. 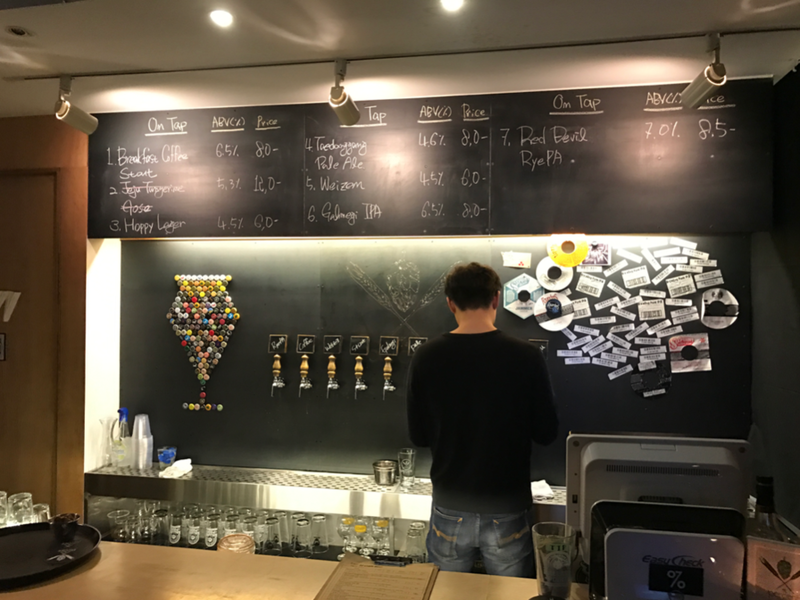 From having a few brews from The Booth itself to collaborations with Evil Twin and the delectable Danish brewers, TO ØL, I knew I was in for a bevy of different brews. Four of the five beers brewed in part by The Booth were pale ale variants, and the other was a moderately hopped Irish Red Ale. One look at what the tables around us were drinking and the bottle selection for the evening and it became very clear that the lighter ales and lagers had been traded out for a dryer, more hopped up flavor. IPA's reigned king in this pub. For good reason too, after being gifted a free tasting by the manager that evening (thank you generous stranger! ), my favorite was their in-house brewed, robustly roasted and mildly malted, Brew Bro Black IPA. It was the only beverage I went back for seconds of that evening. 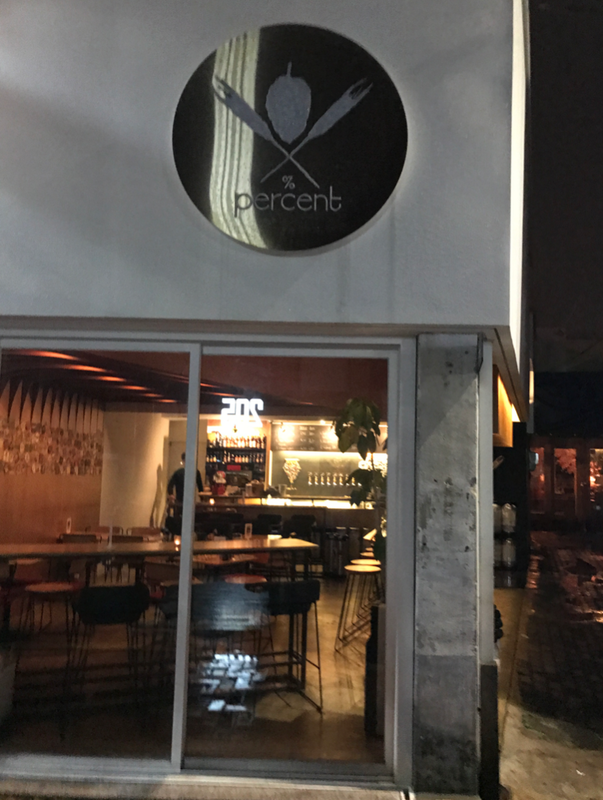 This is truly just a generic overview of the newly-dense beer scene in Seoul. 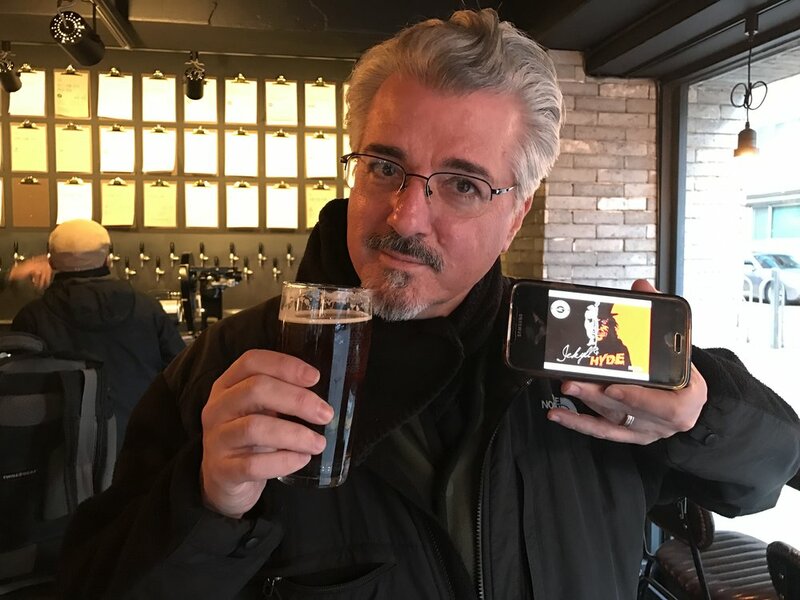 When we return to Seoul in the spring I will be reporting more on specific breweries in the surrounding areas so stay tuned! After our time in Seoul it was time to open the show a couple hundred miles southeast in Daegu. Almost everyone involved with our production, backstage and onstage, said that there wasn't anything to do in Daegu. That there wasn't much to do, see, eat, or drink. I tried to remain positive but however, it became painfully obvious when we got there that there really was not much by the hotel besides restaurants that didn't open until 6pm, a plethora of convenience stores, and oodles of fried chicken and soju. During the day this area was a strange ghost town of motels, casinos, and a slew of Korean BBQ establishments. A week into the trip, on the quest for secret Santa gifts, I was in a grocery-mega-store in the middle of nowhere and found the wailing wall of beers. 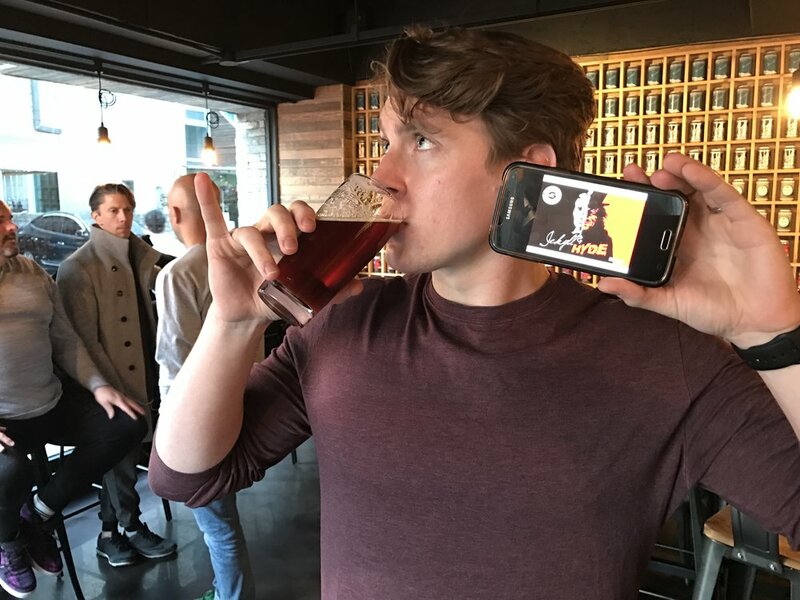 Brews from the States, very few from Korea, the usual from Europe, and a surprising debut of beers from New Zealand and Australia gave me a feeling, I like to think, of how Taylor Swift felt when she finally got "Out of the Woods." That was a very good week for this beer nerd. Two weeks later Jess and I were exploring their brand new department store, Shinsegae, and stumbled upon a craft beer store inside of the Korean equivalent of Best Buy. Nerd. Gasm. Surrounded by life-size comic book characters, computers, and video games I scanned the surprisingly excellent selection for any bottle shop let alone one in the middle of an electronics store! 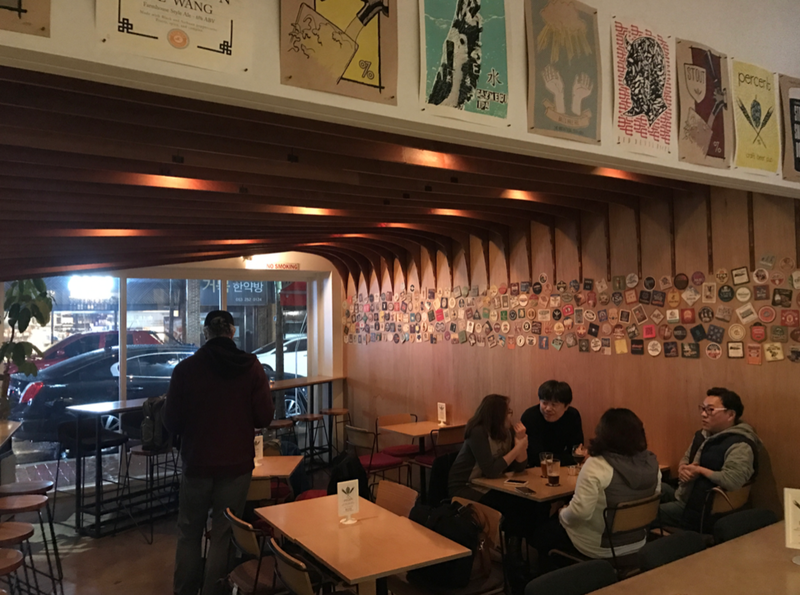 The true hidden gem of Daegu though is located on the outskirts of the south-eastern part of town, Daegu Bottle Shop. One of my colleagues had found their business page on Facebook and when I tried to find it on a map it didn't even exist! I hopped in a cab and told the driver to drop me in the general area. After aimlessly wandering around another deserted area, a friendly Korean store owner calling the shop for me, and getting lost a second time I finally found it. 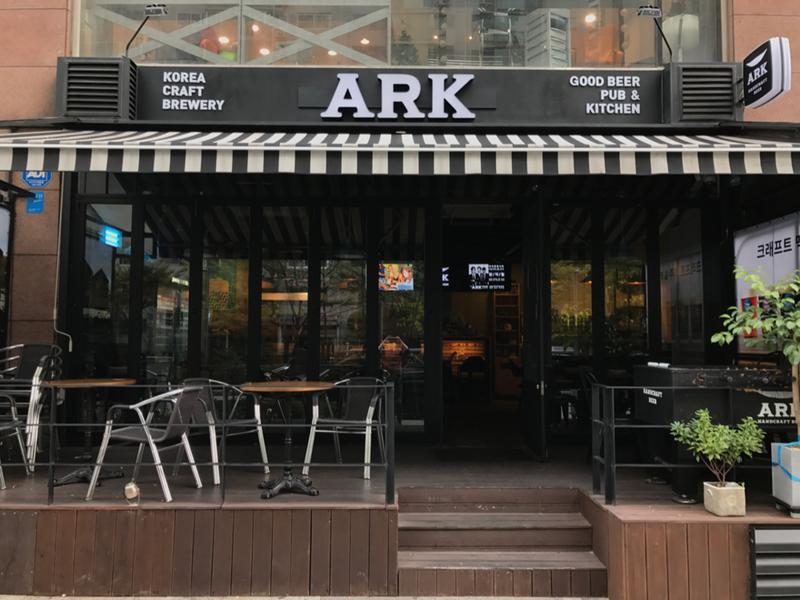 Opened just a little under a year ago, the facade of this treasure trove looks like a tiny, mom and pop Korean restaurant because, well... it is. I hesitantly knocked on the door and gesticulated "Beer???" and was led to a tiny room where only two refrigerators stood. I was admittedly a little bummed at first that I had made this trek only to find two small fridges but what they held in them was pure magic. Prairie Brewing, Stone, Rogue, Brooklyn, Delirium, good Lord. I felt like I was going to explode! Even though it was all western brewed it made me giddy to find such a haul in such an unassuming place! After spending far too much money (but really what is the price of love right?) I thanked the man and went on my now merry way. 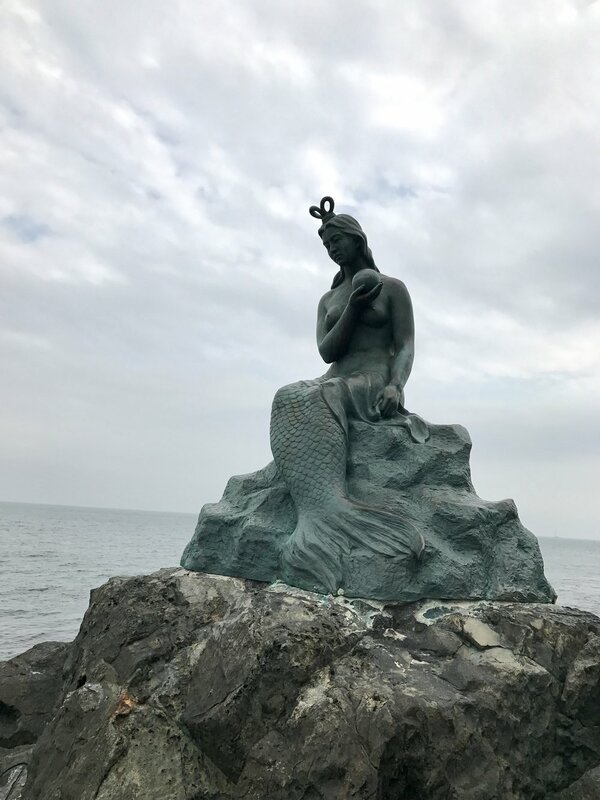 Even though there really wasn't much in Daegu in terms of sight seeing, it still proved to be a fruitful visit. Complete with new friends, new brews, and thousands of Korean Jekyll and Hyde fans.